It seems every (Buddhist, at least) home in Thailand has a spirit house just outside. These are to attract good spirits, and keep the unfriendly ones at bay. 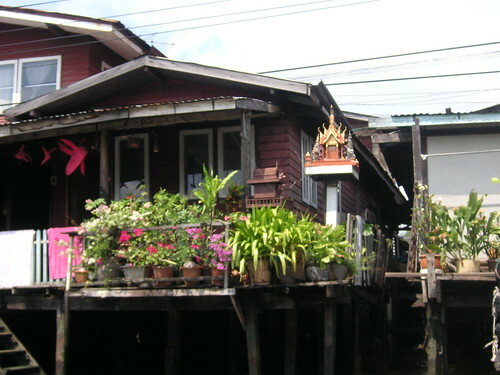 Of course the stilt houses in the canals are no exception — it’s the mini-temple looking thing in the upper right side of the shot. This entry was posted on October 16, 2005 by somuchworldsolittletime. It was filed under Ayuthaya, Bangkok, Thailand, Uncategorized .